As promised, here are two more cards that I did based on sketches over the last week. These cards use the same design, from the Mojo Monday Sketch #75, but they’re totally unique. Don’t you love how that works? For the Giggle Notecard, I continued working with the same basic design ideas that I used in the last set of cards: one flower, cute script sentiment (both from Stampin’ Up! ), Moroccan prints, along with blues and yellows. But because I made the base of the card from Bazzill’s Lakeshore card stock — a nice medium blue — I needed to brighten the card up on that first layer more than a layer of Desert Sun card stock would have. Lemonade seemed the better option. Note to self: Write down color names before throwing out packaging! I did a little tone-on-tone stamping with the lily image and the sentiment on this card. The lily is stamped in Stampin’ Up!’s Soft Sky and the sentiment in Baja Breeze. I think those two In Colors (one from this year, one from last) are stunning together. Shakes fist at cruel fates for not making those colors available simultaneously. With the lily image and pearls, in addition to the springtime color palette, this notecard is perfect for Easter. For the Butterfly Notecard, I broke away from Fifth Avenue Floral and my blue/yellow scheme, but followed the same template. This card uses SEI’s Oasis paper. Check out the cool embossing on the left side under the butterfly. This paper set also features a fun copper metallic that’s a blast to play with and looks fantastic with Stampin’ Up!’s Soft Sky. To get my butterfly, I just ran one of the Oasis papers through my Big Shot along with Stampin’ Up!’s Beautiful Butterflies die. Piece of cake! I think it looks very summery. And considering we’re suppose to get some more snow here in SLC, I’m needing summery projects right now! 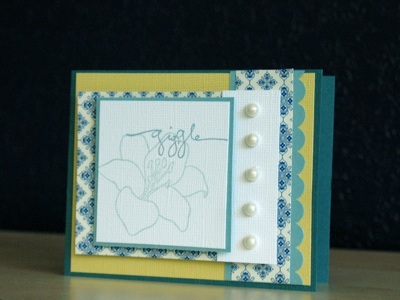 giggle notecard recipe: cardstock: bazzill basics paper and stampin' up! ; patterned paper, stamps, ink, pearls, and punch: stampin' up! 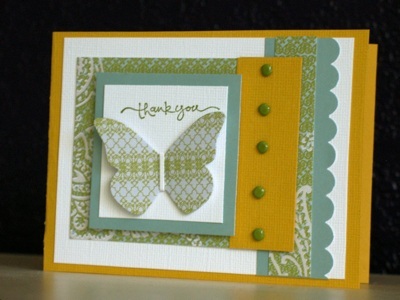 butterfly notecard recipe: cardstock: bazzill basics paper and stampin' up! ; patterned paper: SEI; stamps, ink, brads, and punch: stampin' up!